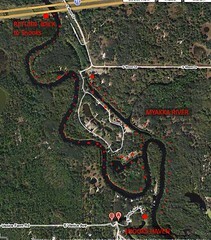 We put in at Snooks Haven in Venice FL, and took a few detours going upstream - we turned around at I-75 bridge and went back. Total 5 miles. My yak buddy Gene and I went to Myakka after eating at the Cracker Barrel for breakfast. We couldn't find the launch at T. Mabry Carlton Reserve (we think it was a locked gated area)-so we launched from Snooks Haven. (free if you don't use their fancy launch) I saw a deer at Mabry reserve...I also saw eagles going for fish--some turtles-and we finally saw a GATOR!!! From the looks of his head and snout he was probably a biggun'...we saw him go under and waited about ten mins...he came up and was checking us out...Great area!